Just in time for a warm stretch of September, Presque Isle’s new playground is officially open at Riverside Park. PRESQUE ISLE, Maine — Just in time for a warm stretch of September, Presque Isle’s new playground is officially open at Riverside Park. The new playground opened Saturday and was celebrated with a ribbon cutting during the BikeMaine festivities in Presque Isle. The project to replace older playground equipment at the park totalled more than $500,000 in private and public funds and was made possible through a fundraising collaboration between the Presque Isle Rotary Club, the Presque Isle Kiwanis Club and the United Way of Aroostook. 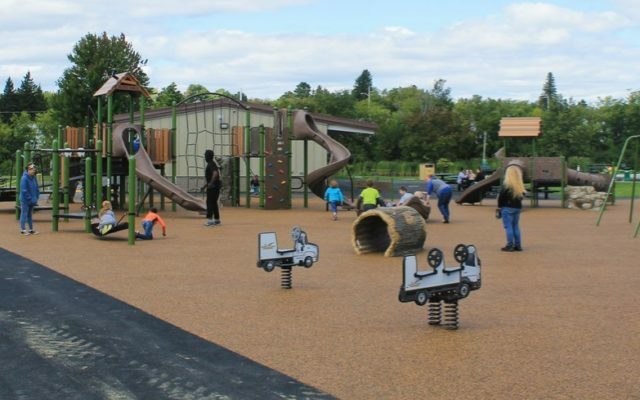 “The playground speaks to the future of Aroostook County,” said Jason Parent, executive director of the Aroostook County Action Program and president of the Rotary Club for 2018-2019. Parent said that the playground also is a testament to the power of collaboration between service organizations and municipalities. The Rotary and Kiwanis clubs partnered with the United Way of Aroostook and the city of Presque Isle to tackle a major project that would have been difficult for any one of those entities to complete on their own. Total donations from community businesses, organizations and individuals since the project started in the fall of 2016 amounted to about $330,000, with the city contributing another $285,000. The new playground has 32 different features, including a jungle gym, slides and swings, geared toward infants up to age 12.